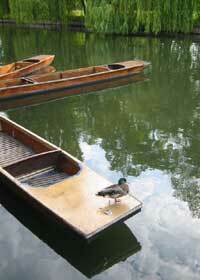 Want to go Punting in Cambridge? If you are planning a trip to Cambridge or if you are a local of the city and intend to go punting on the river Cam, then, despite first appearances there are a number of alternatives to Scudamores Punting Company some of the more reputable and long running organisations are listed below. Cambridge Chauffeur Punts – Silver Street Bridge. Despite the name this company also provide self hire punts at a rate of around £16 per hour during the week and £20 per hour at weekends. Scholars Punting Cambridge – La Mimosa punt station, nr. Quayside, Bridge Street. Independent punt company offering chauffeured tours along the Backs. Please see the map on our geography page for details on the specific locations of all of the above.